This book by Pete Scully is one of the books in the 5-Minute Sketching series. The other one's by Liz Steel and it covers architecture. As mentioned in the other review, mine's the version published by Apple Press and Book Depository is selling it at the lowest price that I know of online. This book is essentially a book of ideas, tips and techniques. The text for each tip is quite brief though and there are no step-by-step instructions. The book provides you with the idea and techniques and invites you to experiment and explore. It's a good book to refer back to for inspiration. 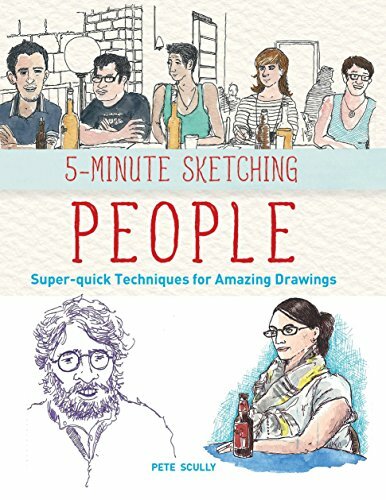 If you want to get really good at sketching people, I would also recommend Lynne Chapman's book called Sketching People: An Urban Sketcher's Manual to Drawing Figures and Faces which I feel is more informative. There are two publishers for the book, Firefly Books and Apple Press. Price will differ depend on who and where you get it from.